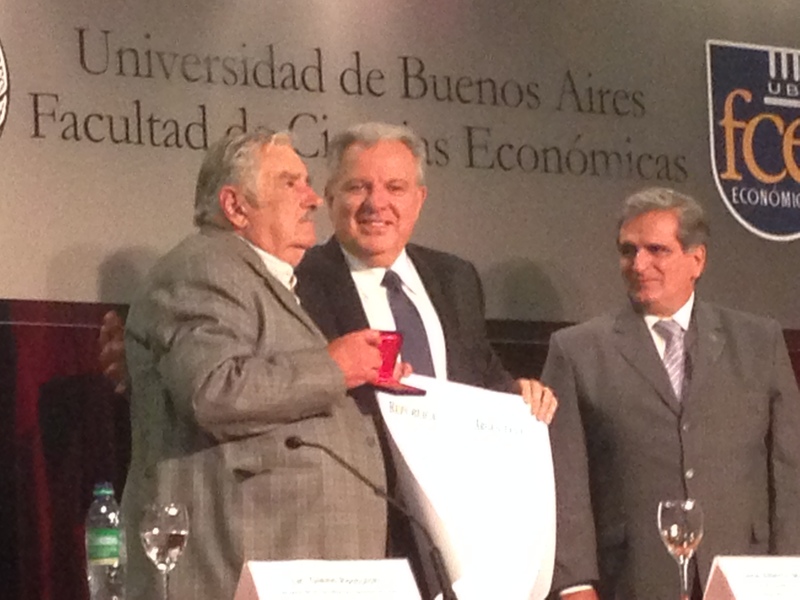 Current Senator and former President of Uruguay José “Pepe” Mujica was awarded a diploma distinguishing him as a Doctor Honoris Causa of the Universidad de Buenos Aires School of Economics last night. The ceremony took place at the UBA School of Economics despite a minor disturbance earlier that day in which university students cut off the street and demonstrated after a new dean was appointed despite “irregularities” in the voting process. The ceremony began with a spirited introduction by the dean of UBA’s School of Social Sciences, Glenn Postolski, who spoke of Senator Mujica’s struggles during the Uruguayan dictatorship (1973-1985) and accomplishments throughout his political career. The crowd erupted in applause when Postolski mentioned the fact that Mujica legalized marijuana in an effort to combat drug trafficking during his time in office. Following Postolski´s introduction, Mujica spoke briefly to the audience about Latin American unity and the need for a new system in order to confront the economic and political issues of the region today. “We lack the political will to integrate ourselves. Let´s face the facts,” affirmed Mujica in regards to regional affiliation. “I know my language isn’t very academic,” added Mujica to the crowd’s amusement. In the end, Mujica, surrounded by a sea of smartphones and cameras, obliged the press by answering some questions and signing autographs before departing the university through the side garage in a silver Toyota.